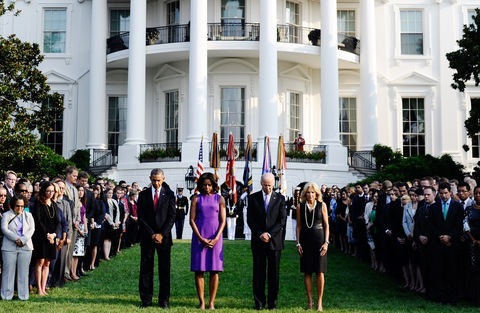 WASHINGTON — President Barack Obama marked the 12th anniversary of the Sept. 11 attacks with a moment of silence on the South Lawn of the White House. Obama, along with first lady Michelle Obama, Vice President Joe Biden and wife Jill Biden, walked out of the White House at 8:46 a.m. EDT, the moment the first plane hit the World Trade Center tower in New York a dozen years ago. They bowed their heads to observe a moment of silence, which was followed by a bugler playing taps. PBS NewsHour will live stream events honoring the 9/11 anniversary Wednesday. President Obama is scheduled to attend a ceremony at the Pentagon at 9:30 a.m. EDT. Dozens of White House staff joined the Obamas and Bidens on the South Lawn to observe the anniversary. The president will attend a Sept. 11 ceremony at the Pentagon later Wednesday. He also plans to mark the anniversary by participating in a volunteer project.